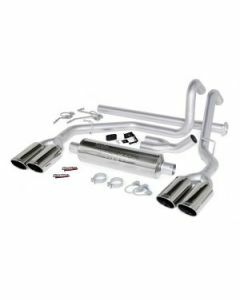 If your vehicle's engine isn't living up to its full potential or if you just want to find that perfect exhaust sound, an aftermarket exhaust kit is a great solution. A performance exhaust system will unleash the hidden power that your engine is wasting because of its inefficient stock exhaust. Torklift Central installs all major manufacturers of aftermarket exhaust kits including Banks, Afe, Flowmaster, Dynomax and Borla to maximize your engine's exhaust flow. Banks Performance Exhaust Systems give your truck a signature throaty exhaust note while increasing both power and fuel economy. Banks exhaust, mufflers and tips are all crafted from quality materials such as stainless steel. When you go with Banks you know you're investing in the very best.